Finally, here I am with my all time favourite crabs gravy. I have observed that people who are very fond of fish, dont prefer crabs/prawns much and vice versa. Obviously I am in the second category. At my native Kodkani, its very rare to find the crabs in the market. These are usually caught by people for their own use. Usually we ask Thimmappa to catch them for us. Many of the people at our native know how to catch them (No..I have never tried my hand on it). People say that they go to river with a lantern on ‘amavasya'(no moon) to catch them. The crabs live in small nest-like holes in the sand. They are caught using some kind of ‘big pincers’ (I am not able to recall what this tool is called). There are usually two types of crabs that we get at our native. One is the crabs that we get in river which are called ‘Kurle’, these are black in color and second type are sea crabs which are called ‘jhali’/’jhale’. The river crabs have harder shell/bone than the sea crabs. The sea crab flesh is more sweater compared to the river crab. The crabs which are caught on or around “amavasye” (No moon) are the best ones with full of flesh and the ones caught near or around “hunnime”(full moon) do not have much flesh (they are called as ‘pollu’, meaning ’empty’). I still wonder how these things matter in the life cycle of crabs. Cleaning of crabs, though looks like very difficult thing, can be mastered very easily. Click here for a tutorial of “how to clean crabs“. Anyway this is not required for those who live in the places where the cleaned crabs can be easily got. In Bangalore, I liked the crabs thali at “Fish Land”, in majestic, where we get all the sea food cooked in Konkani style. Most of the people use the 10 walking legs also for the gravy. But we usually discard them. 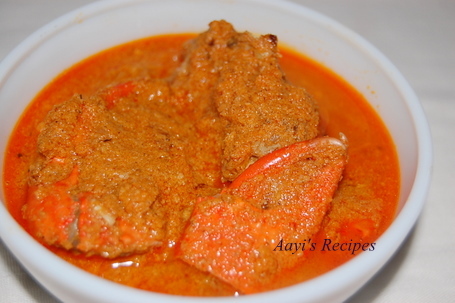 A gravy prepared by Crabs cooked in freshly ground coconut. Clean the crabs. If the crab is big, cut them into 2 pieces to make eating easier. Slightly crush the legs with pestle(beat it just once or twice just to crack the outer shell slightly). Heat 1 tea spn of oil and fry coriander seeds. Grind them with red chllies, coconut and tamarind to a smooth paste. Heat remaining oil and fry onions till they are slightly brownish. Add ground masala, salt and cook for 2-3 min. Now add the crabs and cook for around 12-15min. The taste of gravy increases once the crabs absorbs the gravy. So preferably serve it after 3-4 hours. can we use the crabs found in stores in the Us here? if so which type?? Supriya,I used the crabs from Chinatown. Since the names were not written, I bought the smallest ones which looked like crabs, I know that is the worst answer I am giving you. So I will find out what they are called when I go to market next time (I never heard of alaskan snow etc, I checked in google, both look reddish in color.But the one I bought had black shell). Let me find out and tell you more. Which red chillies did u use ???? I would like more info on cleaning crabs. I absolutely freak out on crab curry and haven’t had them in over 2 years now. I have reserved this privilege for when my mom can visit the US and teach me how to cook ’em!! With help from you…looks like there’s no need of waiting. nice recipes Shilpa. the modified look of your site looks great. did u see, i am able to post comment on ur site, but it’s from my husband’s office laptop, not from our own compu….have to check. Lakshmi, Thanks a lot. I have to still think why you are unable to comment using you comp :(. OK, so now that I’ve given you the excuse to bring home crabs, maybe you should invite me over for lunch. That way I get first hand experience on EATING and maybe………just maybe I”ll pay attention while you are cleaning them. Otherwise we can repeat!! Yes,Yes, Cleaning Crabs Post please!…… Please….. I am really scared to clean crabs……. I have similar questions as the rest of the readers, will wait for your post about the name of the crab and its cleaning process. Preeti, you are welcome any time :). LG, Arjuna, I will post about it on Sunday or Monday :). Keep visiting. Wow. thats a great piece of information Priya. Thanks for sharing :). Shilpa! My mother makes this ‘Gashi’ without corainder seeds, have you tried it? Doc, I will try this dish without coriander seeds next time :). Shilpa you mentioned to use red chillies in recipe I would like to know which red chillies to use plzzzz ??? Great Site Shilpa….enjoyed it immensely……the Pole recipes…brought back memories of childhood and the Udipi Restaurant (not existing anymore) next door to Sitladevi Temple in Mahim, Bombay. Came across your site while looking for North Indian Khadi Recipe with Besan Waddi…Loved your Crab recipe…Although we Goans just Steam the Crabs with Onions, Red Chilli Powder, Tamarind,Tomato Paste with Garlic and Ginger Paste…That story about the Light of the Full Moon is partly true…Also it is difficult to catch prey when the crabs are fully lit up…simply logical….Reminds me of a Konkani saying…..Chorac appli sauliche bhirant…(the thief is scared of his own shadow)…LOL…Love and Peace. I use ‘dungeness crab’ that we buy from the chinese market here in the US. I buy just 1 crab (for myself and my husband) and make it in ‘Malvani Style’ (wherin we fry onion, coconut, corriander-seeds, cloves, cinnamon, black pepper, poppyseeds, fennel seeds in 1 tsp of oil and grind it to fine paste to make the gravy). It tastes great with dungeness crab. I think dungeness crab will taste good with your ‘Kurle Ambat’ recipe as well. What I like abt this kind of crab is, it has a lot of flesh and the flesh comes out pretty easily. Even the 8 legs which we grind and strain to get the juice from (which we add in the crab gravy) is full of flesh. So I do not grind the legs here and add them in the gravy just like the 2 claws.. Moreover, if you ask the people at the fish counter to clean it, they will generally clean and cut it except the deshelling part of it. Thanks for the new crab recipe. I want to try your style of crab now. So u are from Kodkani,my mom is also from the same place,one addition to the kurlya ambat(crab curry)which my mom makes is she puts little fenugreek seeds(methi seeds) while frying the onions. SImply loved the interesting crab facts, though i think its just u Konkanis that abound in such stories!! HAve you tried crabs in butter Garlic Sauce? Its rather simple : heal some butter in a pan, put in looads of finely chopped garlic & a lil bit of leeks/Spring onion. now add the steamed crabs & cook for a while, sinful & heavenly, but very fattening…dont tell me i didn’t warn you! Many thanks. Some lovely recipes. I must try them one by one. I love shell fish, specially big tiger prawns which comes from Sri Lanka and and other parts of the Indian Sub continent. These are avaliable very fresh, but one has also got to pay the right price. Some are sold at Â£34(Sterling) per Kilo. So ytou can imagine. It is like buying gold. I go to Goa every 2 yesrs or so, and hire a small one bedroom appartment near Colva beach, so that I like to cook myn own food,m specially sea food, like bangda, king fish etc.Fresh and very tasty. Could you kinldy put my e-mail address in your mailing list, so you can send me your latest recipes from time to time. I will be most grateful. Joseph, I am yet to setup a mailing list on this blog/site. I will let you know. Thanks. Usually I post once in every two days. You can use RSS feeds that I have provided. I use google reader to keep track of all blogs that I visit. The best crab gravy in the world is served at ‘Passage to India’ , Kaula Lampur, Malayasia. If u really love crabs, like I do, simply fly to KL, if only for the crab gravy. This comment is in reference to your say about Goans, For your kind information Goans don’t just boil the crabs with onions, they also make Crab sambhar known more as Crab Xec xec, also green masala crabs, crabs salad etc. I know u want people to check ur site for ur recipe stand in the same line without giving wrong information about others, so that people can vote u with their good comments. Please change ur ways of expression about others or don’t talk about them if u don’t know well. Shilpa: I am not sure what you are talking about, I don’t see any line in my post or in comments where I have mentioned anything about Goans. If your comment is in response to someone else’s comment in this thread, be polite to make that note and explain your opinion on how you think the recipe is done. I only write the post and users from various countries and places post their comments. Your talk about my purpose of this site, is entirely misunderstood. Please read the ‘Pages’ section of this site, if you really want to understand. Do not write comments only reading some line in some post without checking who has posted it and in what context. At the least, it helps to be polite. If it were to be for praises, I wouldn’t have approved this comment. Its believed that crabs can hunt much better during the amavasya since their prey cannot see them in the absence of light as compared to full moon.. so crabs have more meat if caught during amavasya time.. I enjoyed visiting your Website. Some of your recipes look great I will definitely try them specially Kurle Ambat. This has to be my favorite recipe. And I have to say,it comes out exactly like my Moms. Thanks a ton for posting it. Recently i come to know about your website from my friend. I was trying some other chefs recipe which is not pure konkani recipe. From your website i tried several recipes all come out well. I do different version of crabs (as i like them lot) curry instead of only corriander seeds i add 1 tsp of jeera and 5 coves of garlic. It smells wonderful. Your version i liked lot. You made konkanis feel proud. I am from goa, working in bangalore. I miss goan food a lot and hv tried many of the recipes on ur site. I must say, i am so glad i can eat exact goan food becoz of u. Ur doing an excellent job, god bless u. Wondering how to identify “Laakh” in the crab. My mother discarded some of the stuff inside the crab shell and kept some of the yellow stuff in the curry. It tasted good althought I don’t know how to identify it. Do you? Shilpa: We usually call the red portion of it as laakh. Since it is the only red thing in crab, you can easily identify it. i have been following your recipe’s postd onilne they are good, i have tried the nipattu’s they r good. The crab recipe also looks goo. also the info abt more n less flesh on no moon and full moon day was very informative. Sorry Shweta, there is no option for reader’s recipes on this site. It is a personal website. Thanks for the offer anyway. i made kurle ambat today….like u iam also a big fan of kurle….perfect for the cold weather….recipe that my mum prepares is also the same except that she adds lil bit of grated ginger and 1 or 2 green chillies at the end…give a try sometime…turns out very well…..
Crabes are common arround Mirjan.We were not crushing the legs while preparing gravy.Thanks for the tips.Could you please tell how to make crab soup. I am delighted to read on crabs, dish, Kodkani and Fish Land Hotel at Majestic, Bangalore. I had the occasion to taste variety of sea foods there. Having stayed in Hegde, Mirjan and Kodkani are familiar to me. Now a resident of Mysore, I badly miss crabs here. A small clarification I wanted to have – my mother (from Hegde) used to prepare Kurle Sukke. I believe same ingredients as prescribed for Kurle Ambat are used. I am yet to taste other dish viz. Kurle Fry. You did a great job. this is d best way to project how good cook one’s aai is. we love aai made recipes and u have touched heart of many such people by giving them these recipes and tips. It’s really very very tasty. Shilpaji, you have great website. I saw some of your vegetarian recipes and they looked awesome. You are doing great service to community by sharing these recipes. Thank you so much and I commend you for putting in effort to put great vegetarian recipes on the web for the benefits of others. Non-vegetarian diet is very much non-vedic. Killing animal and eating itâ€™s flesh is against Sanatan Dharma and quite frankly, very barbaric. On the other hand, vegetarian diet is very healthy and there is no karmic reaction. Please practice non-violence to these innocent and harmless creatures who never come to harm us and live in a place inhabitable for us. If we are not kind and merciful to others, what right do we have to request mercy from the Lord. I am a very infrequent cook and was browsing sites for some good ( and easy to make) amchi recipes. I settled in on the egg curry and it turned out really good, Wife and kids loved it. So i have to thank the person to whom this credit is due – You. Your site is really well done and the variety is superb. We plan to try the crab preparation soon. Will let you know how that goes. Going through your site also brought some fond memories for me, especially the mention of river Aghanashini – my great grandparents from my mother’s side come from Masur and Sanikatta ( in North Kanara). Great job on keeping these recipes alive – thanks again. crabs which caught during amvasya–no moon- is power packed with flesh. in mumbai, crab lover prefer to eat during these days. crab is very good for knee pain relieving -i have experienced it. hoever it is very costly in mumbai- about 1000 for one kg of crab. Great post Shilpa, first time commenting here. My husband loves crab, will try this for him. Divya, crab cleaning post is already on the site, the link is specified in the above post, please check it out. My wife is from Karwar. (ankola) from Pai:s famaily. and i am gsb.So every sunday , wensday we have nonveg dish. we speak konkani in home. i am tries all nonveg receipes. My son like chiken very much.he is also diehard non-veg. Hi Shilpa, I am a Bengali. Usually my mom fries the crab pieces before putting it into gravy. Here you suggest not frying, just boiling… Could you tell what difference in taste that would make and since the shell is so hard would it not take a lot of time to boil the same. Moumita, I have never fried crab before adding to gravy, so I am not sure why it is done. Just like fish, they get cooked well when added directly to gravy. Also, all the juices get absorbed by the gravy and makes the gravy very delicious. We don’t need to add extra oil for frying. I assumed that was how crab curry is made.But Just didn’t wanted to risk it.So I went for the above method. !! Hi, Thanks for a great recipe. The taste was great. I could not get the color right though. Mine was a mild brown. Also the thickness was missing. the coconut was sinking to the bottom with the water on the top. Did you use a particular chilli. I used byadgi. Also do you use a blender for grinding the masala? I use byadagi chillies too. You can try with Kashmiri chillies. I use Sumeet mixer for grinding. You need to grind it to a really smooth paste, otherwise it will separate. Add ginger when grinding to this recipe I tastes awesome! Hi I just found your blog looking for new crab recipes!, looks like you’ve been keeping up with it for many years! Great work! I wanted to ask, what is the difference between ambat and sukke? sukke looks dry, and I suppose ambat is more wet, but otherwise, the ingredients look mostly the same. Are they both Konkani? I can help you understand the crab life cycle if you are curious – crabs molt their shells like snakes when they grow, but for snakes, they shed the skin because they do not have a shell. The crab grows a new bigger shell immediately, and gains almost 100% volume, but it’s muscle mass is still the same. So that gives it the appearance of being pollu, but in reality it has the same meat as a smaller crab before molting. As for the moon phases, that could be a superstition. There are few reliable ways to tell when a crab will molt at any given time, and it may be correlated with the moon. It is possible that the species of crab where you are from molts with the moon phases, but that is not true of all 5000 species of crab. The crab you have in your picture is called the mud crab, Scylla serrata. I saw other people comment on which crab they should use. I think the best substitute for US readers is the blue crab, because it is in the same family as the mud crab.